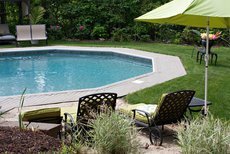 A person who has a pool, trampoline, swing set, or other similar structure in their yard is usually required, by their homeowner’s insurance, if not by law, to also have a fence. This is because these structures are seen by the law as attractive nuisances. This means that a child who sees such structures, and who may not appreciate the danger they present, is likely to trespass on the property to play in, on, or with them and injure him or herself. The doctrine of attractive nuisance puts an obligation on a homeowner to protect these children who are incapable of protecting themselves. Determining when a child is innocent enough to qualify for protection under the attractive nuisance doctrine is also unclear. A person with diminished mental capacity may be considered a child for these purposes even if he or she is over the age of 18. The determination of who qualifies as a child is made on a case by case basis. Using a fence is a good way to make sure that a child passing by is not intrigued by a potentially dangerous condition. Even if the child is able to see over the fence, he or she will have trouble climbing over it, sufficiently discouraging the trespass in order to avoid liability for injuries sustained. A sign warning individuals of danger may be enough to protect a homeowner from liability, except when a child is unable to read the sign. Regularly inspecting property for potentially dangerous conditions and making sure trespassers stay away from your property are the best ways to avoid liability under the attractive nuisance doctrine.